Jim arrives home from a tough day at work only to find a nightmare: trash spilling over, dishes in the sink, daughter Ash holed up in her room with the music blaring, and his bedroom left in shambles by wife Pam, whose messiness drives him nuts. Jim explodes, cleans house, lectures Pam... but fails to see the bigger picture. dewy blanket. The inflatable screen waved gently. THE MESS was hidden near the end of the night. main character. Then the ending blew my companions away. wanted to thank you for your story. Sincerely, Raven." 4/09 -- THE MESS has been chosen to receive the 2009 Hollywood East Film Festival Gold Coast Award for outstanding achievement in filmmaking at the April event in Connecticut. 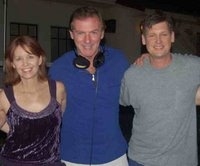 1/09 -- Kudos to The Mess star Rus Blackwell for his work in the wonderful "The Curious Case of Benjamin Button." He plays "Robert Williams" and shares scenes with both Cate Blanchett and Brad Pitt... at the same time! 8.25.08 -- The Mess will be off to Fredericksburg, Virginia and a screening at the Rappahannock Independent Film Festival which takes place from Sept. 17 - 21. 7.29.08 -- The Mess finds some love at the Charlotte Film Festival, taking place Sept. 25 - 28. We'll screen twice on the 26th at separate venues. 7.5.08 -- The Mess lands a spot at Indie Fest USA which takes place at Downtown Disney in Anaheim from Aug. 8 - 15. We're going to Disneyland! 6.25.08 --The Mess has been chosen one of 12 short films in the "Short Circuit Traveling Film Festival" which will tour some 36 venues throughout the Southeast from October '08 to June '09. 5.9.08 -- The Mess played to a very receptive audience at the historic Crest Theatre as part of the Delray Beach Film Festival. 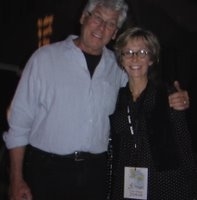 Co-producer Lisa Maile enjoyed meeting "Rocky Horror" Star Barry Bostwick (above). 4.13.08 -- Fresh out of post, The Mess screens before the largest crowd ever at the monthly Enzian Film Slam and takes home the top prize. Crew readies an exterior shot. Pam & Jim share a quiet moment. Ash and Pam strike a pose.